Chef Floyd Cardoz loves making Thanksgiving feasts with a twist! What are your Thanksgiving traditions? For Top Chef Masters winner Floyd Cardoz, Thanksgiving means getting together with family, watching football, and cooking a Thanksgiving feast that’s traditional with a twist. 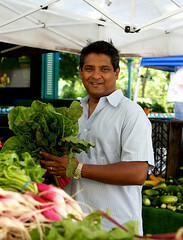 Chef Floyd Cardoz loves cooking with fresh, seasonal ingredients - especially from his garden! Long before he was a Top Chef Masters winner, Chef Floyd Cardoz was a fan favorite of mine. In addition to creating the tasty Tabla dishes for FreshDirect (his favorite’s the Tabla Banana-Leaf Wrapped Salmon), Floyd is a father based in Verona, NJ who loves to garden and cook for his family. I was excited to have the opportunity to chat with him about what he learned from winning Top Chef Masters and his cooking advice for both parents and those who say they don’t know how to cook.